Di622 is compatible with Canon's E-TTL, E-TTLII system, and Nikon's i-TTL system. The light distribution angle is automatically adjusted for the lens focal length. A high quality stepping motor sharply traces the lens movement with the same speed as that of the camera manufacturer's original flash model. The flash beam covers the frame from 14mm (with a wide angle diffuser built-in) to 70mm of the digital lens. For a longer lens, the flash head reflector position stays at 70mm. It turns 90 degrees upward and 270 degrees horizontally for bounce lighting.The flash head also stores a small reflection panel for fill-in shots. The focal length for the traditional SLR camera is to be multiplied b a factor of 1.5. The Di622 has a special photo sensor built-in. 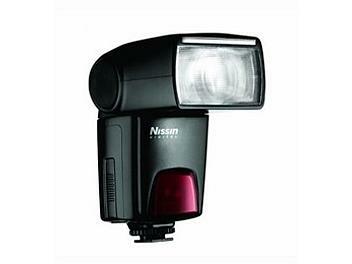 Place the Di622 off camera and the flash will synchronize with the master flash placed on your camera. This wireless remote flash system is called slave flash technology and is often used for a creative lighting efficiency. Use the camera's built in flash, the camera manufacture's original flash or the Di622 as the master flash. Place one or more Di622 flash units away from the camera. The sensor circuitry of Di622 is compatible only with the latest pre-flash TTL system offered by Canon or Nikon.The Di622 is not compatible with traditional flash systems or studio flash systems. AF Assist light : Infrared LED for distance of 0.7 to 6 meter.